Are you looking for a truly recession-proof franchise in a rapidly-growing sector? If you like the idea of a flexible, easy, home-based business with no rent to pay, no staff to employ and no stock to hold, then Yes Appliance Rentals could be the ideal investment for you. In today’s economy, the cost of living is getting more and more difficult for the average consumer to bear. Many prices are predicted to increase, and The Bank of England has warned that inflation on an average basket of goods will rise to nearly three percent. Whilst this is a fairly gloomy outlook for us, it does mean that the appliance rentals market is experiencing phenomenal growth. People are finding that they cannot afford to buy the essential, household appliances they need outright, and need more flexibility. That’s where Yes Appliance Rentals comes in. Paying ‘bit by bit’ means that customers on smaller incomes and with limited credit options can afford to furnish their homes or replace essential appliances by using an affordable payment plan. By becoming a franchisee, you will have access to a tried-and-tested business model that has been specifically designed to weather economic uncertainty. The size of the appliance rentals market is approximately 12 million people in the UK; it is worth hundreds of millions of pounds and growing all the time. 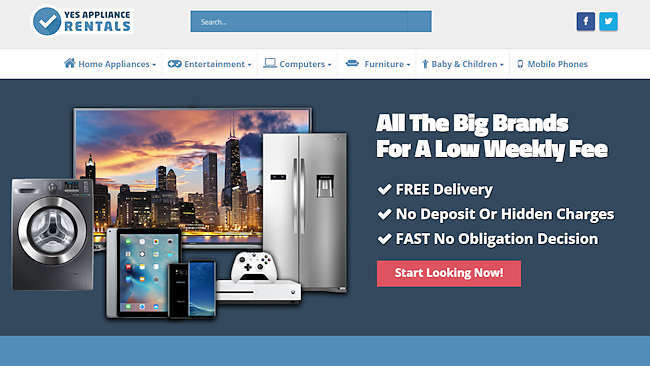 The Yes Appliance Rentals franchise opportunity is perfect for anyone wanting to take control of their future and start their own business, with full support and advice from a reputable franchisor. It’s easy to get started and you don’t need any specialised knowledge or previous experience. Entry costs are among the lowest you’ll find anywhere and it’s so quick and easy to get started that you could be trading within a matter of weeks. As a franchisee, you have the freedom to be your own boss, but at the same time are backed by an experienced team that will provide everything you need to start and grow your own business. There’s comprehensive training on policies and procedures, sales and marketing and ongoing support whenever you need it. Is it time to take action and make your dream a reality! You will be amazed at how quickly your weekly income will grow with this proven business opportunity. If you like the idea of a passive-income business with ongoing training and support, then please get in touch with Kevin at Yes Appliance Rentals on 0333 370 1526 or visit our franchise website to find out more about this exciting opportunity and confirm whether your local area is available.